We all use energy every day. Energy is available to us in many different forms – food, heat, electricity, petrol. But where does it all come from? When we switch on the light, it starts to glow. Where did it get the energy it needed? 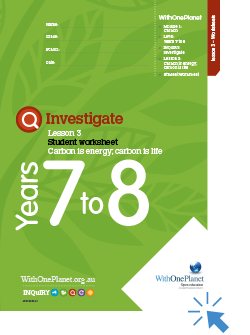 The Carbon is energy unit is an ideal way to investigate the science of energy and improve the scientific literacy of students in the classroom. It provides opportunities for students to investigate their understandings of energy – where we get it from and how we use it – and through discussion and debate, arrive at their own considered opinion about our energy sources – both renewable and non-renewable – and what we can do to sustain these into the future. The digital versions of these resources are designed for use with Adobe Acrobat Reader and are set up to enable students to be able to enter and save their answers within each document on their desktop. Adobe Acrobat Reader is free and can be downloaded here. Hitch a ride on the carbon cycle! What’s at the end of the carbon cycle?